Nutritional value of kale is about abundant vitamins and lutein. Nutritional value of kale includes abundant vitamins A, C and K.
Somehow we've been hoodwinked into thinking we only need enjoy foods that taste great; worse, we've allowed our kids to become accustomed to the idea that they only need eat what pleases them. Let's be honest; the cabbage family does not have great flavour. Unless you dicky it up with onions and garlic, and your favourite spices, it's really rather dull. But they are full of great vitamins, minerals and phytochemicals; the stuff that prevents a toxic homocysteine buildup, reduces osteoarthritis and helps in your struggle not to get cancer. What it tastes like really should be immaterial. This page was last updated by Bernard Preston on 20th December, 2018. In short, kale is a food that, if not daily, one should certainly be consuming several times a week. Kale is also rich in fibre and helps keep the stool soft and easy to pass. It comes in a wide range of varieties, each with their own special virtues; our first introduction was to the very tall kind; the only problem is that it was also the birds' favourite. It was a biannual, so the third year we planted a small curly leafed type. It's also good, but the birds were right; the taller variety with a bigger frond was more tender and tasty; now that we have hens they too have discovered its virtues. The seeds germinate very easily, so it's not necessary to buy small plants; one of the great features of this brassica is that it grows equally well in the summer and winter; in fact, kale is a bit sweeter after a frost or two. Of course, it won't bear through a Chicago Christmas; how I remember the blizzard of '79 when the young chiropractic student had to ride on an ancient bicycle through three feet of snow to the local Red Lobster to keep the growing family fed; it was hard work being a waiter, student and father, all in one. Plant the tiny seeds a few inches apart in a shallow drill, and then thin them, transplanting into a row like that above. This is the short, curly variety; it lasts for months just as spinach does. 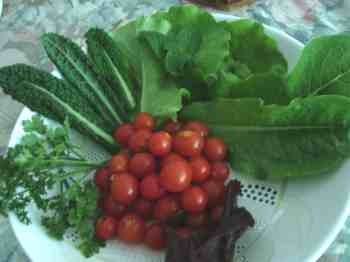 There should be no shortage of your green organic foods in the garden. That's the tail end of a pole bean crop on the fence behind the curly kale. The trick is to save bean seed, a crop of winter peas will go in; plenty of legumes help to provide an ample supply of protein, reducing our reliance on red meat. Banning legumes is the great dubious in my mind about the paleo and banting diets, because of their starch. Nutritional value of kale also includes proven reduced risk of cancer and it's great for your eyes. This table incidentally clearly shows why we should be eating from a wide range of foods. Kale is very rich in vitamin K, but poor in folate, that vital substance that prevents spina bifida and keeps your kids smart in school. Broccoli is tops in vitamin C, but low in calcium. Spinach is queen when it comes to B6, folate and calcium, but is lowest in vitamin C.
Kale has only only small amounts of betaine, but spinach is vastly rich in it; 2500 times as much. So, Monday and Thursday it's kale for dinner; Tuesdays and Fridays you can enjoy your broccoli. Wednesday and Saturday is Popeye food and on Sunday you can have pancakes. Actually one of my favourite pancake fillings is spinach or kale fried with onion and garlic in butter, and then rolled up with feta cheese. In fact, I'll bet the nutritional value of various varieties of kale also differs; one could and perhaps should enjoy short and tall, curly and Italian. Above I mentioned that one of the great kale benefits is the rich variety of phytochemicals. For example, nearly fifty different flavonoids have been identified, known for prevention of cancer; research proves the reduced risk in the case of the breast, bowel and prostate. Two of them, lutein and beta carotene, have been proved to reduce the risk of cataracts too. Kaempferol is one of those bioflavonoids; scientists are so excited about its anti-cancer properties that they are researching it could be used as a drug for preventing metastases in particular; you don't need to focus on the nutritional value of kale; just enjoy it; regularly. We will hear more about kaempferol and cancer prevention in the future; as a medication it will be hugely expensive as drug companies look to maximise their profits, but in your nutritional value of kale it's dirt cheap in prevention; we enjoy at least a few leaves daily. Researchers have found that a phytochemical called lutein, and it's twin sister zeaxanthin give 40% protection against a very serious eye disease called Macular Degeneration; and guess what? 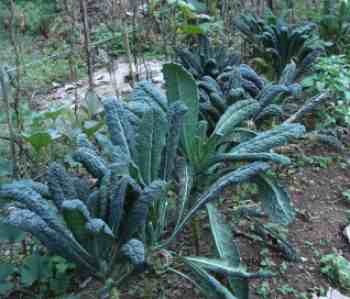 It's found most richly in kale, cooked and raw. Read more about lutein benefit. It also has strong anti inflammatory properties; hence the benefits from those suffering from inflamed blood vessels, muscles and joints. Kale also a small amount of omega 3, but only three percent of what you need every day, so I didn't add it to the table listing the nutritional value of kale. Every bit helps in the fight against inflammation, but in the main get it from fatty fish and flaxseed. The above table is for one cup of your cooked greens; it's rare that one can find the health benefits of raw versus steamed vegetables. 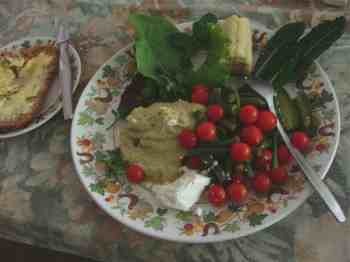 Both kales no doubt have their value, so we have the tiny immature leaves in our salad for lunch, and cooked for dinner. Helen and I will share this for lunch; three kinds of lettuce, baby kale, two kinds of parsley and of course the tomatoes. Already we have seven of the eight mandatory colours demanded for each day; that's if you want the proven 35% reduced risk from all causes of death over a twenty year period. Added green beans and hummus and half a jalapeno and we're home and dry. Smother with olive oil and freshly squeezed lemon juice and you have a delicious meal; I'm having a hard time deciding whether to enjoy plain bread and butter, or to spread raw honey from our hives. Our low GI bread and butter are so special that I often have no other condiments on it. Did you know butter is back? Folk often ask if we are vegetarians; the answer is an emphatic no. 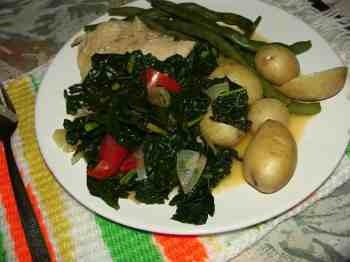 We had both pork and chicken tonight with our lightly cooked kale; but we eat red meat only once or twice a week. 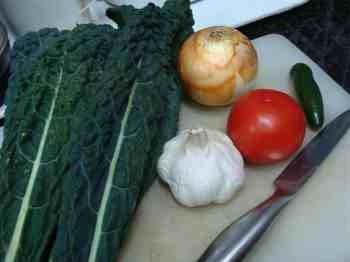 It's best to cut out the thick and chewy stalk; fold the leaf in half and one snip with a sharp knife will remove it. It's often recommended to steam kale, and that's fine, but I like to add it to onion and garlic fried in butter, and then lightly steamed with a tablespoon of water. We cheat I'm afraid; the stems are hard, so I devein any big leaves first. They don't have a great deal of flavour so, to get the medicine down, not a spoonful of sugar but steamed with garlic, jalapeno and tomato. Enjoy this kind of food daily and I promise you the days of counting calories will soon be over; so will the statins and a lot of the drugs you may be taking. One thing I particularly like about this cooked kale dish is that it takes less than ten minutes to rustle up from scratch. We call it slow food, made fast. 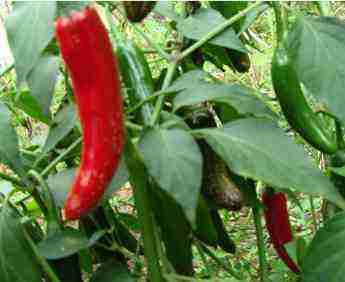 Add as much, or little of the chili as you enjoy; the capaicin in the seeds and placenta are also strongly anti inflammatory, surprisingly. Those kale bushes above are months old and we enjoy our organic green foods almost every day in one form or another, raw and cooked; nothing could be easier. The nutritional value of kale is sublime. Every male SHALL enjoy a tomato a day, by the way; if you don't know why, type tomato prostate into the search function. There's a 50% lowered risk from the nastiest, most common male cancer; that means impotence. I'd rather eat tomatoes; and avocado to reduce the other prostate bogey. It's so easy to mix kale, tiny raw shoots, or the larger cooked ones into your food. Can you now answer what is kale good for? Or, farmers' cabbage in English; we first encountered the nutritional value of kale in Holland where it's made into a traditional dish called stampot. Mashed potato into which is forked a mixture of kale and bacon bits. Potato has quite a high glycemic index which, on its own would make it fattening; but, by adding the fibre of your kale and the fat and protein of your bacon, you have a perfectly acceptable and healthy meal. Eet smakelijk. Enjoy; here are more recipes for cooking kale. If you're an ebook fan, you can download Stones in my Clog in less than one minute onto your Kindle, smartphone or tablet; a fascinating chiropractor's seven year sojourn in the polders. Come and tour Maastricht and Scheveningen, and Kinderdijk with me; these are a wonderful people, but learning their language was a nightmare. Bernard Preston questions the need for so many chemicals in the garden; whilst it may not reduce the nutritional value of kale, and make it better looking, does that overcome the effect of pesticides on our bodies? Farmers reportedly use particularly toxic organophosphates in the growing of kale; the creepy crawlies are particularly fond of it, and for good reason. Yet, after growing kale for four years now, I find it has almost no diseases; a little fungus in damp weather on the older leaves. In your own garden you can enjoy veggies and fruit largely without chemicals. This enjoying of an organic garden is just one more reason why we take zero medication and our weight is perfect; we eat as much of, and whatever we like without guilt. The cholesterol bogey in homemade ice cream, and generous butter on my bread last night doesn't frighten me; the fibre in kale keeps my cholesterol rock bottom. Can you imagine a life without statins? Now new research is suggesting that statins actually cause atherosclerosis. The nutritional value of kale is not to be downplayed in our struggle towards better health. Am I a healthnut? Absolutely! But I watch out steadfastly for the health nut neurosis that can so easily creep in; it's all about balance. Organic food greens challenges you to see how many colours you can add to the nutritional value of kale in your salad or supper. Variety is the spice of life, so the saying goes, and it applies to food too. There's good reason to add a few florets of broccoli, or beetroot tops to your kale. They take much the same length of time to cook. 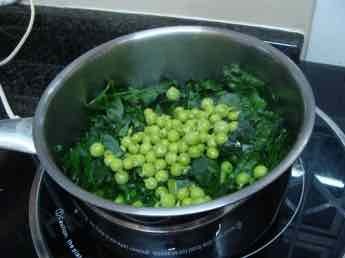 Adding fresh green peas is one way to add vegetable protein to the nutritional value of kale for your dinner. This evening I got a big surprise. We share a home with our daughter and her family; the cooking duties are also halved. Tonight my grandson, aged two and a half, absolutely demanded to finish what was left of the mixed kale, onions and fresh green peas. My wife and I had to go without. The point is that children's tongues can be trained, and so can ours. Cooked imaginatively, the health benefits of kale are as easily enjoyed, and as delicious as any other vegetable from the garden. Growing zucchini would be a good yellow if you have issues with your eyes as it is the best source of both lutein and zeaxanthin. Did you know that processed fruit juices are real junk food with a high glycemic index; that means they are very fattening. Don't give them to your children. 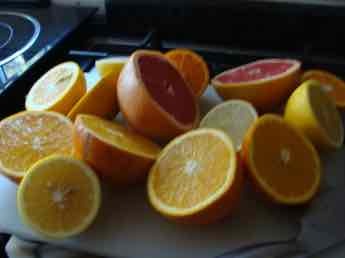 But it took me only two minutes, literally, to halve and press these five different samples from the citrus fruit list. I timed it. The nutritional value of citrus, like kale, is not to be underestimated, if your enjoy it together with the pulp. If you are prediabetic, then do test your blood glucose several times after orange juice, even that with all the pulp. It puts my BG into orbit and I have to take a walk after breakfast, or risk injury to my coronary and other arteries. Eggs Florentine is poached on a bed of spinach making the perfect Banting breakfast.